Correct specifications are critical to ensure that any project runs smoothly. Poorly written or nominal specifications have in the past resulted in some disastrous situations for clients, architects and builders alike, as the specification legally forms part of the construction contract. Substitutions and variations resulting from poor specifications are prone to litigation and this is best avoided! 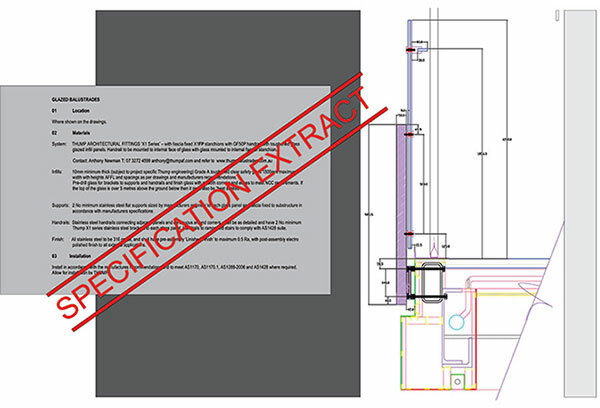 To ensure that all relevant standards and building legislation are correctly referenced please contact our design team on 07 3272 4599 or info@thumpaf.com We can provide a project specific specification in word format and project specific CAD files to assist with documentation and detailing. We are more than happy to assist in this regard. This is the most diligent way to achieve a correct specification, as glass thicknesses, glass types and component sizing are all affected by building type, location, imposed load requirements and balustrade heights (both above finished floor level and overall height above the ground). Generic specifications are able to be viewed for each of our system configurations in the “System Options” section of this website. As all of our components and systems are fully manufactured in Australia there is an almost limitless potential for modifications and changes. If your desired design outcome would be better suited by changes such as: higher glazing, glass fixed to reverse side of stanchions, longer handrail brackets, higher posts, double glass, frosted glass, alternate fixing brackets and finishes etc etc etc then please don’t hesitate to contact us as it is almost certainly able to be accommodated.